Frank's All Surface Refinishing can apply a Non Slip Finish to the bottom of your Bathtub or Shower. This can be done while we are Refinishing your Bathtub or Shower Stall or at a later date. You can throw away your germ ridden bath mat. These mats actually cause mildew build-up under them and sometimes trap water and moisture, thereby becoming the cause for rust to begin. If you have a new home or a brand new Tub and do not want your Bathtub Refinished but are not happy with the slip resistance from the factory, please call us. 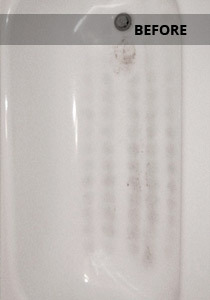 We can apply a clear Nonskid finish to the bottom of the Tub that is not visible. This is a permanent application and will not collect dirt or become discolored. This is also an excellent option for apartment complexes, motels and hotels and nursing homes. Most insurance companies will tell you that most slip and falls occur in the Bathroom. Providing this protection for your family or your customers can protect you against expensive lawsuits. 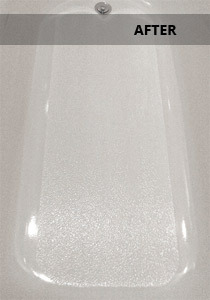 This Anti Slip application can cost as little as $25 when done while Refinishing your Tub or Shower! !